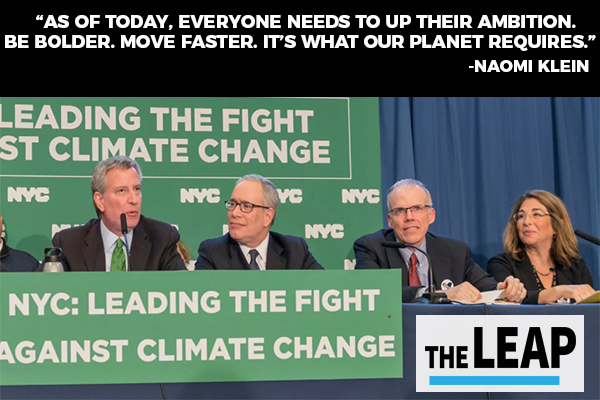 A speech given by Naomi Klein on January 10, 2018 during NYC Mayor Bill de Blasio’s historic announcement. What’s happening here is not only about changing the economics of energy, speeding the transition from dirty to clean. And it represents a collective victory for the amazing climate justice movement around the world and in this city. Groups like Uprose, the New York City Environmental Justice Alliance and New York Renews, some of which are here today, as well as global groups like 350.org, which helped kick off the fossil fuel divestment movement about five years ago. For a very long time, our movements have been insisting that principles of justice need to be at the centre of the response to the climate crisis – a crisis that plays out in the most perversely unjust ways right now. Justice means that people who did the least to create this crisis but are bearing the heaviest risks and most toxic burdens need to be first to benefit from green economic development and job creation. Justice also means that workers in polluting industries are not sacrificed or left behind. And justice means something else too, something most politicians are loath to talk about because the wealth and power of fossil fuel companies is so vast. It means that the corporate interests that did the most to get us into this mess – with their pollution and with their campaigns of wilful misinformation – are going to have to pay their true share of the tremendous costs of climate disruption, and of delayed transition. Because right now we have it upside down and backwards. As it stands, the costs of sea level rise and ferocious and unprecedented weather events are offloaded on to the public, with taxpayers stiffed with the ballooning bills. And as governments absorb these costs, there is less money for schools, for affordable transit and housing, for health care. And, in yet another bitter irony, this hurts the people who are already impacted by climate change the most. This city saw all this in dramatic fashion during Sandy, when it was the people in public housing who were left for weeks in the cold and dark. Meanwhile, the extravagant profits from destabilizing our planet’s life support system, earned from ignoring and suppressing the scientific consensus – well, those are systematically privatized. Earlier this decade, ExxonMobil alone made $45 billion in profits in a single year– more than any company in history. Enough to pay Rex Tillerson, then its CEO $100,000 a day. In short, the status quo means the poor are paying again and again for the polluters to get even richer. It’s a world upside down. But that starts to change today. 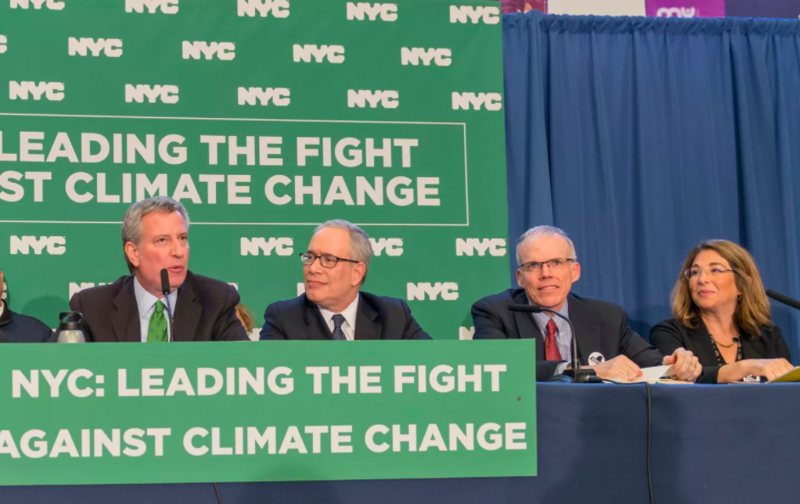 By suing these five oil majors who knowingly deepened the climate crisis, and simultaneously beginning the process of divesting $5-billion from fossil fuel companies, New York City is taking a game changing first step in turning the world right side up. And not to overstate the case, but I actually think this could change the world. There have been lawsuits before that have tried to sue the fossil fuel giants for climate damages. The tiny Arctic community of Kivalina, population 383, which attempted to recover the costs of having to relocate. Some citizens of the low-lying Pacific Island of Vanuatu– population 300,000 – that began a similar suit. A lone Peruvian famer, suing a German coal giant for the risks to his home. A small group of Gulf Coast Mississippi homeowners, with the help of a scrappy lawyer, who tried to sue the fossil fuel companies after Hurricane Katrina. These have been valiant attempts, but in every case, the industry has relied on the relative weakness and poverty of its accusers, sometime managing to quash suits before they were filed. And that is why today’s news is so historic. Because bullying isn’t going to work here the way it has in the past. This lawsuit is coming from the largest city in the most powerful country on the planet, a city which also happens to be the financial capital of world. And now that New York City has thrown down in such a big way – on divestment, on polluter pays — it’s going to embolden all kinds of other actors to step up as well. Other cities around the world. Universities. Foundations. Other states. Even entire nation states. As of today, everyone needs to up their ambition. Be bolder. Move faster. It’s what our planet requires. And it’s what justice demands. No politician on the planet is doing enough. But there can be no doubt that the bar for what it takes to call yourself a climate leader has just been dramatically raised. Well, New Yorkers know how to fight. They even know how to fight on the ice, as the New York Rangers occasionally show. I want to thank all the fighters in this room for reminding us of that. Top photo by Sipa via AP Images.